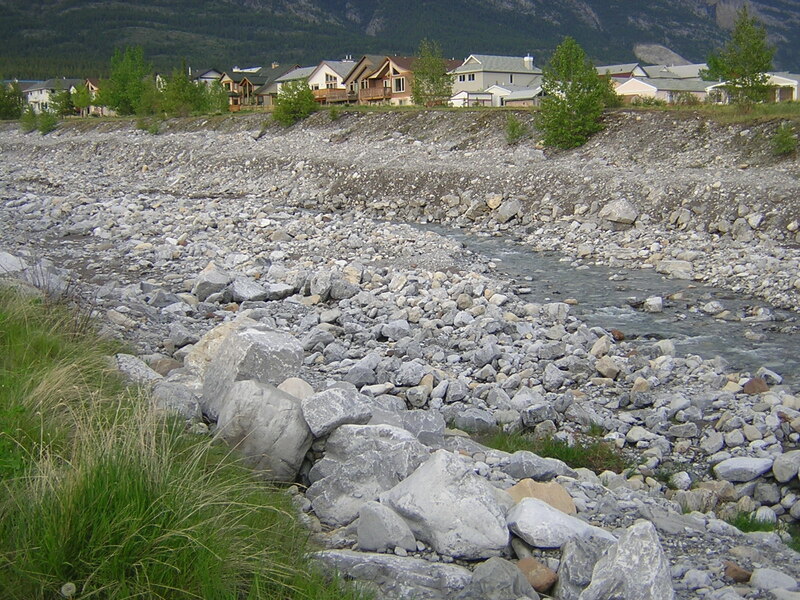 Canmore, Floods, and Southern Alberta Museums | Lauren Wheeler, Can Enviro Rock? ← Public History, Pop History, Academia, and Jobs. Thursday mornings I was woken by a 6:45am phone call from Canmore. It was my mum to tell me the usually dry creek behind the house was a raging river and our neighbours with homes backing the creek had been evacuated at 1am. She described the sound of rocks tumbling down the swollen creek and the trees stripped of bark and branches from tumbling against the rocks. By the time I arrived at work things were getting worse and my heart sunk at the sight of a Tweet naming the street I grew-up on, where my parents and brother still live, as on evacuation notice. It was only a precautionary notice and they opted to stay at home – with the car packed just in case – and continue to keep me posted about what is happening. I found solidarity with all the other Canmore Kids stuck in other parts of Alberta and Canada worrying over what was happening to our hometown and how our family and friends were coping with it all. The flooding of Cougar Creek and the subsequent flooding throughout southern Alberta hit me on two very different levels. 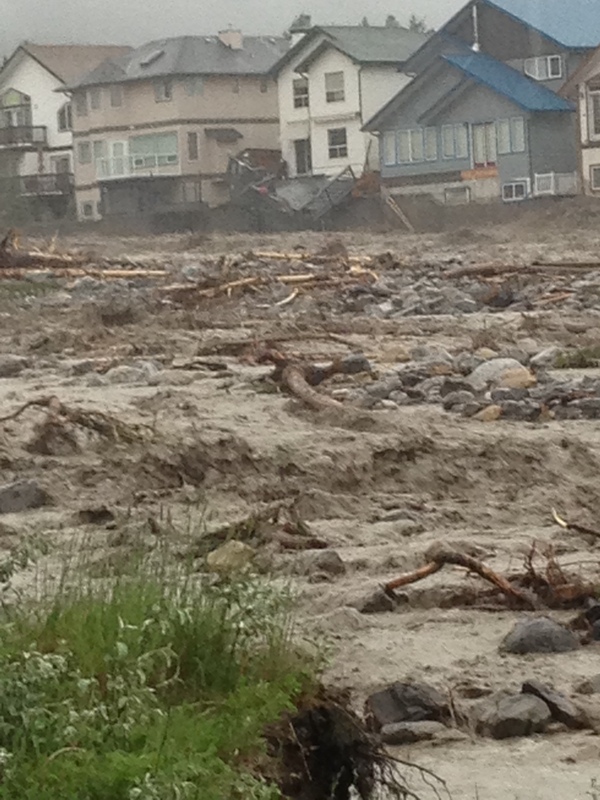 The first hit came with a phone call from my mum on Thursday morning describing what Cougar Creek looked like and sending pictures and videos of the destruction. For two days my parents and brother were on precautionary evacuation notice because the house I grew-up in is on the west side of the creek which is the slightly higher side. I also worried about two museums and archives close to my heart; the Canmore Museum and GeoScience Center was the first museum job I had in the summer of 2002, and the Whyte Museum of the Canadian Rockies where I worked for three summers and where I researched my Masters thesis. The second hit came as I was walking to work at the Alberta Museums Association and realized how many of the member museums would be affected by a flood starting in the Bow Valley. Before I arrived at work there was a preliminary list in my head: Canmore Museum and GeoScience Centre, Whyte Museum of the Canadian Rockies, Buffalo Nations Luxton Museum, Luxton Home, most Calgary museum (Glenbow, National Music Centre, Fort Calgary, etc), Museum of the Highwood, and Okotoks. Over the next two days the list got longer until it stretched from Red Deer south to Lethbridge and from Banff to Medicine Hat. This range includes nearly 25% of the museums in Alberta and for two days the staff of the Alberta Museum Association called and emailed these potentially affected museums to find out if they were okay. The good news is most of the museums have made it out of the worse of the flooding unscathed. However, the museums that were affected by the flooding were hit hard and will need help cleaning up. It is easy to overlook the museums and archives when flooding takes out large swaths of a city but these collections are priceless and to properly dry out a museum or archive after a flood is very expensive. In Alberta there are now a number of museums and archives facing the monumental task of drying out as the flood waters recede. These include the Museum of the Highwood in High River, Fort Calgary, the City of Calgary Archives, Fort Whoop-up, Helen Schulare Nature Centre in Lethbridge, the Buffalo Nations Luxton Museum in Banff, and from flooding earlier in June Heritage Park in Fort McMurray. If the flooding is extensive some of these museums will have to close for the summer season to deal with the clean-up. Heritage Park in Fort McMurrary has already announced they will remain closed for the rest of the summer due to the size of the clean-up job. What the museums and archives affected by flooding need are donations to help pay for the recovery of artifacts and repairs to their buildings. They also need volunteers with museum and archive experience to help with the clean-up work. It is important volunteers know how to properly handle artifacts to prevent further damaging them. 2) If you have museum experience wait until the imminent danger has passed then offer your assistance. My thoughts are with everyone in the areas affected by the flooding in Southern Alberta. The good news from the region is finally starting to out weigh the bad and I look forward to the Trans-Canada opening again so I can get home to Canmore and start helping with the massive clean-up. This entry was posted in Environment, Public History and tagged Canmore, Environment, mountains, museums, public history, Reflection. Bookmark the permalink. im glad i found your article, because ive been worrying about this kind of thing while reading the news. i particularly had the glacier/mt revelstoke park archives in mind, which were hit by a flood in downtown revelstoke several years ago. do post more as you learn it… hope you are high and dry.